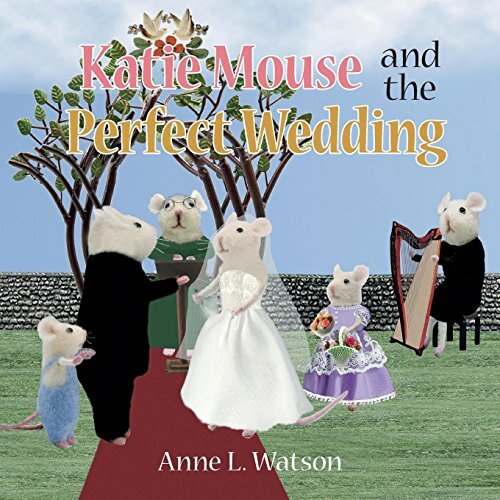 Katie Mouse's Cousin Matilda is getting married! A big wedding has been planned in Mouse Town's public park, and everyone in town is invited. Best of all, Katie will be Matilda's flower mouse, and her little brother Dylan will be the ring bearer. There's just one problem: The Games Day at Katie's school has been changed to the same day as the wedding! And Katie's the captain of her class's relay race team! Will she really have to miss it? As Katie struggles with her feelings, a mix-up with the wedding rings threatens to ruin the entire wedding. It's then that Katie discovers that only she knows how to save the day and make the wedding perfect after all. For ages 4 to 9. In 2016, Anne L. Watson fell in love with felted mice by Bulgarian artist Diyana Stankova. Anne happened to be working on a housekeeping almanac, so she started photographing the mice, posing them in scenes with miniatures in dollhouses, to illustrate the book. Soon she was writing little stories about the mouse family, while learning to use Photoshop to manipulate their poses and composite their props and settings in a creative blend of toys, other photos, and purchased and free art. As Anne added more mice and other felted animals from Diyana and other artists, Mouse Town began to take shape. As might be expected, these adorable but pushy critters eventually demanded their own books, and Anne obliged with the Katie Mouse series. Besides her children's books, Anne writes literary novels and how-to books for grown-ups, on such subjects as housekeeping, soapmaking, and baking with cookie molds. She lives in Bellingham, Washington, with her husband and fellow author, Aaron Shepard, and a growing family of critters. Visit her at annelwatson.com. Mama Mouse was so excited, she nearly dropped her phone. "It's Cousin Matilda. She's going to marry Alexander!" "It's about time," said Papa Mouse, looking up from his breakfast. "Of course you can stay here!" Mama was saying into the phone. "A June wedding in the park! That's perfect!" When Mama hung up, Katie asked, "Will Dylan and I get to go?" "Of course," Mama said. "In fact, Matilda would like you to be her flower mouse. Would you like that?" "Oh, yes!" Katie's eyes sparkled with excitement. "When is it?" "The day before your school Games Day. And Dylan will be the ring bearer!" "I no bear!" said Dylan. If you have any questions about this product by Skyhook Press, contact us by completing and submitting the form below. If you are looking for a specif part number, please include it with your message.